George Bernard Shaw once wrote “Those who seek paradise on earth should come to Dubrovnik”. We’d say ‘ol George was right. 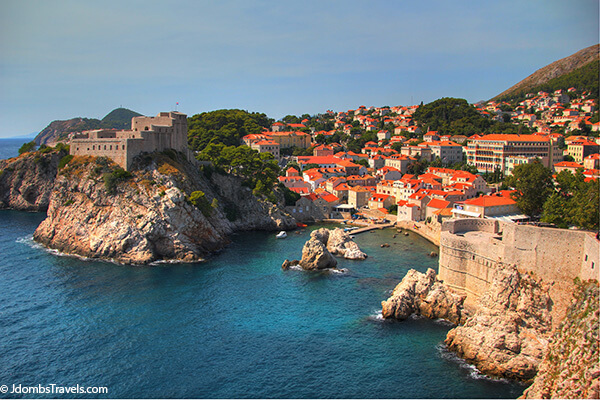 The old town of Dubrovnik is completely surrounded by intact fortified walls, even including the Old City Harbor. The walls run for 1940 meters encircling the city and are considered amongst the greatest of fortification systems during the Middle Ages because they were never breached during that time period. The walls were so strongly constructed, they even withstood any damage from the earthquake of 1667. We walked all 1940 meters of the walls surrounding the city. Nearly 2 kilometers (1.25 miles) doesn’t sound like a lot but take into consideration that we’re having one of the hottest summers in nearly 50 years and that a lot of stairs are involved as the walls vary in height towering above the city at 25 meters high at some points. There are three entrances to the walls and we started our walk on them at the Gate of Ploče. Once we reached the top of the steep staircase leading us to the top of the walls, we were immediately rewarded with stunning views of Fort Lovrijenac rising on a gorge 37 meters high. 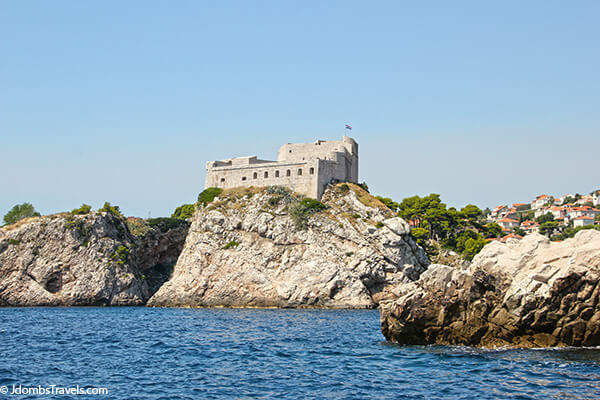 This fort defended Dubrovnik from attacks from both the land and the sea. It certainly earned the message carved into its doors: “Non bene pro toto libertas venditur Auro.” (“Freedom can not be sold for all the treasures of the world”). As we made our way along the walls toward the Old City Harbor, we got a taste for local life in Dubrovnik. Shuttered windows gave way to the sounds of locals having lunch and laundry blew in the breeze. I wondered what the locals thought of tourists traipsing by day after day; of having to keep their shutters closed for a bit of privacy. From the sea side, we had amazing views out to Lokrum island and of the harbor. There is also a little cafe here with a few tables with a “window” view. The cafe serves ice cream and fresh fruit smoothies. A waiter was kind enough to offer Emma a drink of water. From the vantage point high above the city, it’s easy to spot the details like the two bronze men who move to strike the bell on the hour on the city’s Clock Tower. Continuing on, we eventually came to Minčeta Tower and the steep climb up to the walls’ highest point was certainly worth a little bit of huffing and puffing for the bird’s eye view we got over Dubrovnik. Here the walls are 6 meters (20 feet) thick as this fort served as the most prominent defense toward the land. 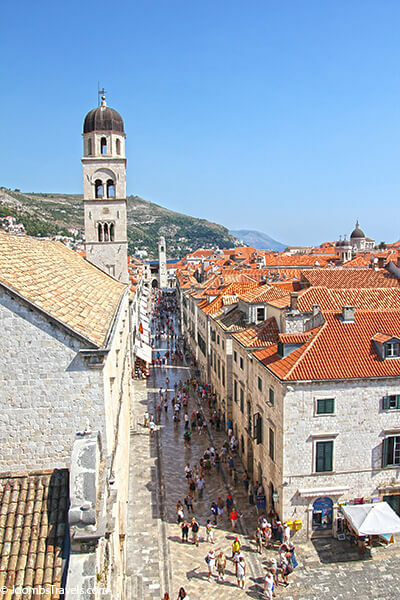 Dubrovnik is a maze of narrow streets all tucked safely away behind its’ towering city walls and gates, complete with drawbridges that were raised nightly to protect the city from Barbaric invasions. Today, the drawbridge at the Pile gate remains lowered and Dubrovnik’s patron saint, Saint Blaise, stands watch over tourists as they stream into the city. 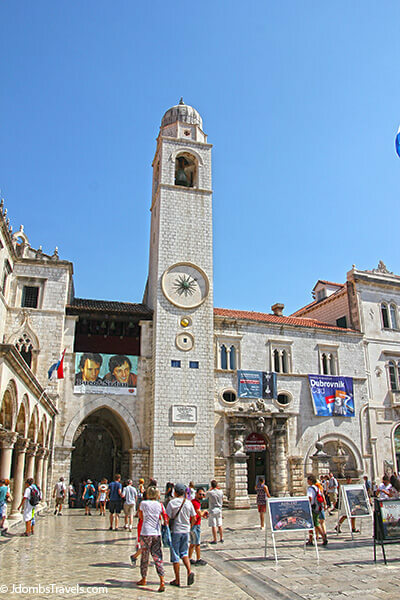 Dubrovnik’s main street, Placa or Stradun, runs from one wall to the other, punctuated by its’ illustrious clock tower. The wide, gleaming limestone street is lined with shops and cafes. Strains of music drift through the air as street musicians strum their guitars and colorful macaws entertain wide-eyed adults with their tricks. The round Onofrio Fountain is surrounded by 16 different carved masks and was the collection point as water flowed into the city from an aquaduct 12 kilometers away. It also served as a fresh water source when the city was on lock down during the 1991-92 siege when Serbian and Montenegrin forces shelled and badly damaged 68% of the city, including the Onofrio Fountain. The Church of Saint Blaise stands at the end of the Stradun and is the place where all festivals either start or end. The church was almost completely destroyed in the 1667 earthquake and was rebuilt in 1715. All that remains of the original structure is a 15th century statue of Saint Blaise holding a model of Medieval Dubrovnik in his hand. Orlando’s Column also stands at the end of the Stradun and symbolizes the wish for freedom of the Dubrovnik Republic. The statue’s forearm was also the Ragusan standard of measurement. Dubrovnik’s Cathedral, or the Cathedral of the Assumption of the Virgin, stands atop two other churches that were discovered during excavations. A legend says that a second, larger church was financed by Richard the Lion-heart, who was shipwrecked off Lokrum Island on his return from the Third Crusade. The people of Dubrovnik saved him and he was so grateful that he gifted them with a substantial amount of money to finance the new church around the mid-12th century. The very first church was built there around the 8th century. Jezuite Street leads to a staircase I ironically mentioned to Tim reminded me of the Spanish Steps in Rome. I say ironically because I later came to learn the staircase is in fact modeled after the Spanish Steps. It leads up to the Jesuit church of Saint Ignacija, modeled after the Gesu in Rome. A number of boat operators line the Old City Harbor offering either glass bottom boat tours or panoramic cruises along the city walls to Fort Lovrijenac and then around Lokrum Island. We randomly chose one of the many boat operators and since they said Emma was no problem, we hopped on board a little wooden boat and waited to set sail. We actually ended up with our own private tour, which is a lot less likely these days with how popular Dubrovnik has become. And there was a nice breeze out on the water that gave us a welcome reprieve from the August heat. We sailed along the smooth, turquoise waters with Dubrovnik’s impressive walls towering above us and then cut across the sea to circumnavigate Lokrum Island. 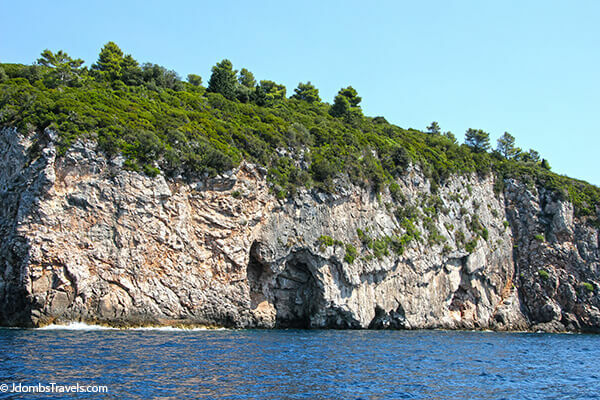 Beautiful coves and caves with glistening waters lapping inside them came into view as we sailed by. Had we had more time in Dubrovnik, we would have loved to take a dip from Lokrum’s shores. We even saw tuna leaping out of the water, amazing us with their acrobatic skills. We really enjoyed this unique perspective of Dubrovnik. We had some great meals in Dubrovnik. Usually we always take pictures of food so we can show just how delicious the food is, but all that walking had us digging right in. We loved Restoran Arka on Jezuite Street. Not only did we have a great view of the lovely staircase modeled on the Spanish Steps, but the food was also delicious. We highly recommend trying the mousaka, a dish of vegetables layered and topped with cheese and then baked. Another restaurant we really loved, and made us really excited to visit Sarajevo, was the Taj Mahal. The restaurant is traditional Bosnian cuisine. We had the house specialty of veal topped with mushrooms and wrapped in dough and then baked with roasted potatoes. Definitely a good pick. There are only three entrances to the city walls and once you’re up on them, traffic is one way. You’ll walk more than 1/2 way around before you come to the first exit. So bring water! There is also minimal shade, so if visiting in the summer, wear sunscreen. Tickets are 70 kuna for adults and 30 kuna for children under 18. Dogs are free. Visiting times are from 8:30am – 6:30pm. 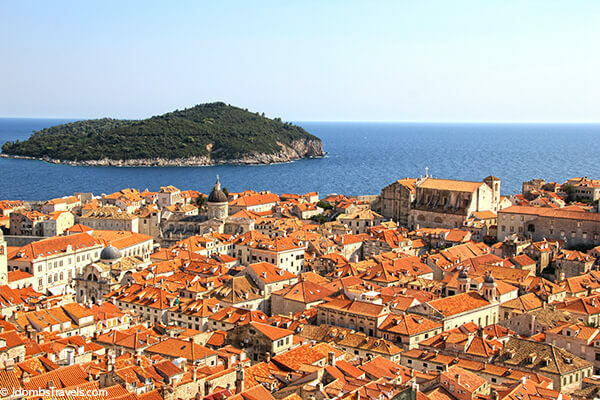 Our friends from Chasing the Donkey, the top travel blog all about Croatia, have an excellent guide on where to stay in Dubrovnik. They investigated every type of accommodation from luxe 5-star hotels to extremely budget-friendly hostels. 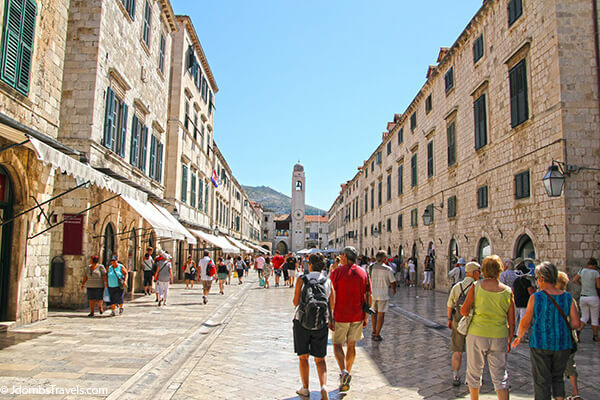 Ahhh very nice pictures of Kings Landing (Game of Thrones reference)…I mean Dubrovnic! Nice seeing Emma defending the city! Lovely pictures the orange roofs against that brilliant blue sea make for a gorgeous contrast of color! Dubrovnik was really beautiful and very different from anywhere else we’ve been in Europe. Definitely visit if you have the chance, Erika! Gorgeous! I am glad to see Emma defending the city. Haha, Kate! It was not very easy to get her to pose like that! Dubrovnik is one place I still haven't gotten too….. Thanks for the beautiful pictorial. 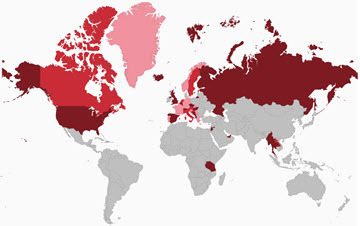 Definitely visit if you have the chance, Carmen! We really liked it. And we also recommend a panoramic cruise to see the walls and forts from the water. I loved Dubrovnik! I was only there for one day, but it’s such a beautiful city. I was there at the end of August in 2009, and even though we waited until late afternoon to start walking the walls, it was still really hot. Kind of hard to avoid in the summer. I remember laughing at how long they told us it would take to walk the whole thing, and then it took us twice as long because we stopped to take so many pictures. Oops! My pictures from there are some of my favorites I’ve ever taken. Dubrovnik was a really nice surprise. We felt like it was really different from anywhere else we’ve been in Europe. And yes, we were sweltering the days we spent all along the Croatian coast. Luckily, there was a breeze up on the walls so it wasn’t that hot while on the walls. I loved Dubrovnik! Will never get tired of seeing beautiful shots of that city! We loved it too. We’ve been feeling a bit Europe’d out and we really felt like Dubrovnik was different than anything else we’ve seen in Europe. That is one lucky dog you have – seeing so much of the world. :) I would have LOVED to have done the boat tour when we were in Dubrovnik, but not enough time so got all my views from the castle wall walk. Which was amazing, but I’m sure it was neat to see it from this perspective. Emma is one lucky and spoiled pup! And yes, it was really neat to get the perspective of what enemies must of thought approaching from the water. That food sounds really amazing!! It sounds like you had a good trip there too! We had really yummy meals, especially in Dubrovnik. You can also hire a kayak and paddle around Dubrovnik’s walls and the offshore island. It’s fabulous getting up close under the walls. 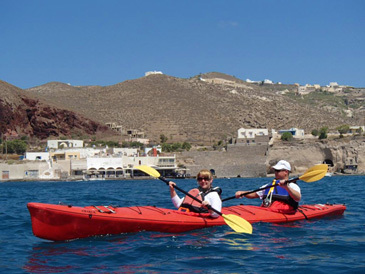 We would have loved to kayak around the walls and out to the islands. I’m pretty sure our dog would never stay in a kayak though. Great pictures. I was just in Croatia a couple of weeks ago and Dubrovnik was definitely my favorite part. It’s funny to see other folks taking the same pictures!